In a large microwave safe mixing bowl, combine mozzarella and cream cheese. Microwave for 1 minute. Remove from microwave and stir to combine. Return to microwave for 1 additional minute. Lightly grease the waffle iron and put one of the pieces of dough in the waffle iron. Top with 2 tablespoons of the pizza sauce, and 6 slices of the pepperoni. Close the lid and cook until the dough is cooked through and the edges are nice and crispy. 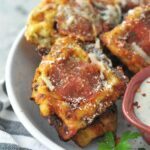 Remove the pizza from the waffle iron and top with 2 tablespoons of the mozzarella cheese, and 1/4 teaspoon of the oregano. Repeat the same process with the other piece of dough. Cut the finished waffles in fourths and serve with extra pizza sauce, for dipping.